I didn't know this until I went to work for Apple Retail, but their credo is "Enriching Lives." I never had a job with a philosophy attached to it. I know the Marines have one. It's Semper Fi. If you see that on a bumper sticker, it's Latin for, "Mess with this car, and you're dog meat." This isn't brick and mortar, it's glass and steel. 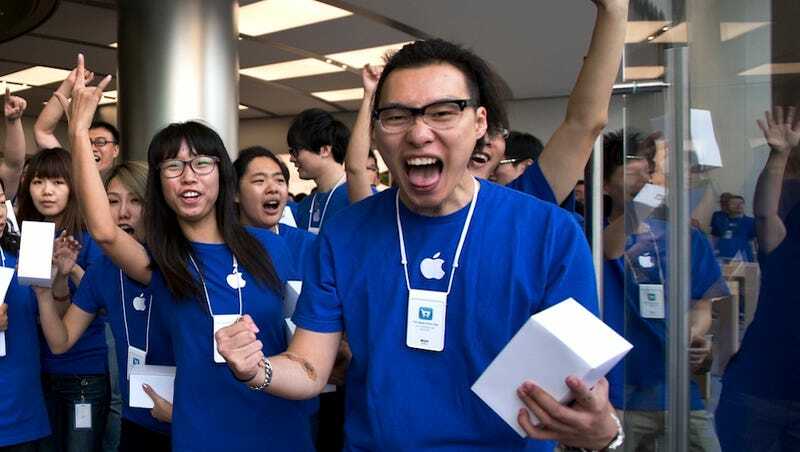 Pseudonymous Apple Store employee J. K. Appleseed takes you backstage at Apple Retail, the supercollider of human expectations and consumer technology. Retail mottos seem heavy-handed. Do you remember when all Macy's commercials ended with the slogan, "That's the magic of Macy's?" Come on, it's a department store, not Disneyland. Can you imagine having to say that every time you rang someone up? "Uh, I'd like to get this tie." "That comes to $29.50. Here's your receipt, sir." "That's the magic of Macy's." "Did… did you mumble something?" "It's bad enough without you pointing it out, sir." "Craig, I'm going on break! To shoot myself in the face." I first heard Apple's credo during employee training. I was not prepared for corporate culture. Sure, there are icebreaking games and group activities, but there's also a long section where you just sit there, and someone reads you the rules. They turn page after page in a manual, reading both the rules and the perfectly rational reasons for each rule. That was a bit intense. The trainer asked if anyone knew that Apple Retail had a credo, which I guess is more serious than a mere motto. Several did. I didn't. It's not printed anywhere. Employees don't say it aloud in the store. I got sort of a smug vibe off of those who knew what it was, and then I realized that I had just become one of them! Nobody told me we were getting a slogan! It just gets put on you with the job, along with two blue shirts and a name tag. Perhaps to ease the silent cynics like me, our trainer then told us one of the most famous recruiting stories in Apple's history. In 1982, Steve Jobs needed to find a replacement to run Apple. He wanted John Sculley, the publicity genius who was the President of Pepsi Cola. Sculley clearly knew how to make the most of attacking a number-one competitor like Coca-Cola, which is what Apple would have to do to Microsoft in the personal computer market. It was far too early to dream of first place, but here was a guy who could make sure everyone perceived you were a close second. After inspirational tours, conversations, and presentations failed, Jobs put it to him this way, "Do you want to spend the rest of your life selling sugared water, or do you want a chance to change the world?" Becca is tall, sarcastic, and thinks the store is perpetually over air-conditioned, so she usually wears a hoodie or sweater under her blue shirt. Her title is Creative. "Geniuses repair devices." She explained on my first store tour. "Creatives teach customers how to use those devices." Technically, everyone in the store teaches customers how to use Apple products in one way or another, but Creatives actually run lessons and workshops. Such educational efforts makes the motto a lot easier to see and believe. From where I stand, the Creative position looks pretty damn good. For starters, I literally have to stand, all day. Creatives get to sit on stools beside their students to deliver the One-to-One service, a year-long membership akin to personal training at a gym. One-to-One is practically free. The annual fee is the same price as an hour-long private computer lesson in any major city, except that it entitles you to as many lessons as you can schedule. Even if a student only schedules two lessons in their allotted year, that's a bargain. A cynic might see the service as savvy PR, while the believer will see it as an expensive commitment to the credo. I see it as both. Some Apple stores have theaters. Others have designated workshop tables where a display can be set up along with a speaker and a portable microphone. Creatives and a few senior Specialists get to facilitate workshops on any number of topics. It must be fun to put on a little show. Those headsets look cool, in a geeky way. When I ask what her job's really like, Becca tries to set me straight. "I've been a Creative for four, five… for too long, so I will try hard not to spoil it for you. Let me just tell you that it's not the job that Apple thought it was going to be." She says, "The first Creatives, and I'm sorry this sounds like a Greek myth, back in the heyday of retail, were hired on the basis of massive professional experience. They had to be able to teach anything, and they were hired directly into the Creative position. Nowadays, you have to work your way up from Specialist and then apprentice in the Family Room. It's a pain. But back then, the company recruited film editors to be ambassadors of Final Cut, sound engineers for Logic, and photographers when they pushed Aperture more. These folks were flown to Cupertino for two weeks, all expenses paid, to study how to teach. Pretty awesome. The idea was that a high functioning level of computer user would flock into Apple stores to meet with Creatives, making it a dynamic space for the exchange of techniques and potential." "The reality is, I spend all day teaching senior citizens how to Google things or post their profiles on JDate. Come on, I'll show you." Becca's twelve o'clock appointment, Denny, is in his sixties. Or seventies. I realize I don't know how to tell. He laughs that he's an old dog learning new tricks. (Becca tells me later he opens with that joke every single time.) He brings a mouse, because his knobby hands find the trackpad unwieldy. The meat of the lesson is that he wants to write a book, but refuses to use anything but TextEdit, because having paid for the computer, he feels that buying word processing software on top is just a scam. Becca diplomatically and patiently helps him justify a paragraph or two. They move onto email. Denny has a buddy in Florida who sends him filthy jokes, and he forwards every one to his son. Yep, he's that parent, the one who makes you consider setting up a special, parental, spam filter. Becca's caustic wit puts some co-workers off, but her honesty puts Denny at ease. She's conspiratorial with him, like they're in on something together, and that makes him feel safe, and that lets him ask the questions he needs to ask. There is real fear behind some of his keystrokes. Not a cartoon fear like the screen will explode if he Control-clicks the wrong thing, but a media-stoked insecurity that's actually founded and grounded. His is a generation that's constantly scolded that their passwords are too easy to guess and frequently alarmed that any email attachment could hide worms and Trojan horses. TUAWjust reported on an Apple ID-specific phishing scam. Everything senior citizens hear about technology is filtered to them through younger people rolling their eyes. It must be maddening to ask for help on something your kids or your kids' kids have already absorbed and take for granted. My afterglow from Becca's lesson, a recharged compassion for the elder generation, and my growing respect for our motto hit a wall when I see a very different grandfather raise hell. He's shouting at a manager, because he was told One-to-One lessons were an hour. They are actually fifty minutes, the manager explains calmly. The Creatives have to take into account the time it takes to end a lesson, field last minute questions, set up another appointment for the customer, and then greet and seat the next customer. The manager apologizes if there was an expectation set for hour-long lessons. The old man feels like he's being nickel and dimed, that his trust has been broken. I disagree. He says he wants to come in once a week? I do the math. If he takes two weeks off for vacation, that's still fifty lessons in a year. Fifty fifty-minute lessons come to less than two dollars per lesson. A buck and change to sit with someone like Becca? How can he be yelling in someone's face about that? I would dread watching him come in at ten 'til the hour, wondering if I'd been assigned to be his teacher. At least Genius Bar sessions are usually done in twenty minutes, good or bad. Becca shrugs and gives me a smile, "It's ups and downs, JK. Sometimes you gotta just sit there and listen." I became a Genius instead of a Creative. I sometimes wonder why Max has never tried for either. He's got the brains, and he's a great communicator. I caught a glimpse, maybe, when a bunch of us went to see Gravity. Nerds at a 3D space adventure wouldn't seem like the obvious place for an altercation, but then again, that is where you'll find us, dateless and up in arms about esoteric technical matters. So the movie ended, and we started the slow walk up the aisle. In one row, a dude says to his bro, "That was like, so symbolic." The bro replies, "What was?" "The part where Sandra Bullock was a baby." "The part where she was floating in the thing, all curled up." "I thought she lost her baby." "No, she was the baby." "Curled up, like a baby. You know what I mean. They curl up?" He tucks in his elbows, lifts one knee, and kind of squats on the other leg. I actually have to bite my lip to keep from laughing. "Fetal position," Max blurts. "It's called fetal position." Spoiler alert—there's a point about midway through the film where Sandra Bullock's character takes a rest, floating weightless, curled up, in a cozy, backlit chamber with a cable snaking behind, not unlike an umbilical cord. The shot lasts for what feels like several minutes, and you'd have to try hard not to recognize that it mimics photographs taken from inside a pregnant woman's womb. I didn't realize I knew that image, but when you see it, it's unmistakable. It's not just symbolic, it's so overt that I can't believe someone has to explain it to someone else. Maybe that's how Creatives feel all the time, and they deal. I can't think of any other recent movie that has used that visual. However, one visual we're all too familiar with unfolds right in front of me. That's where some fool like Max mouths off to the wrong guy. The dude uncurls. He seems to inflate and rotate toward us in slow motion, like an Alien or a Terminator. He's a frowning tower of power when he asks Max, "What did you say?" Max doesn't flinch. The dude's bro sizes me and our friends up. We're not that impressive. "No, I know it." Then Max points at me. "This one's an actual Genius." Nice. Great. Becca hooks Max's arm, peeling him away from the dude. "Just trying to enrich some lives," Max snorts. Becca and I exchanged a glance. Teaching looked fun. Workshops looked fun. Either promotion to Genius or Creative would've meant a life-changing bump in salary for me, but more Genius spots were opening up at that time. The Genius pay rate allowed me to go part-time, and working part-time freed me to take classes, pursue freelance work, and explore internships. I felt like I'd navigated a bunch of life-enriching jobs while still trying to enrich my own. Tack that onto the motto: That's the magic of enriching lives! Clear Eyes, Full Hearts, Can't Lose! Inspired by some of the favorite lessons Creatives deliver in the store, here are three simple things you can teach a beginner computer user in about half an hour. I've taught these to my own parents, who—bless them—are two of the worst computer users ever. On the other hand, I am their only IT source, so investing the time was totally worth it. Having a digital camera or a smartphone means shooting video at almost any time. Or at too many times. Avoid the two most common errors that defeat pleasant viewing. One, don't bother shooting with vertical framing. It may seem to frame a standing speaker better, but inevitably leaves giant black spaces on the usually horizontal display screen or television later. Two, stop moving around so much! Steady your elbow on a desk or wall. Pretend you're on a tripod. Capture the scene, and we'll feel like we're there inside it. Shake the camera everywhere as you strive to follow action, and all we see is motion sickness. Have the talk. No, your bank didn't send you that email asking for your email password. No, there is no such thing as a lottery settlement you forgot to pick up. No, you don't want to watch the outrageous video attachment with the weird extension letters. Phishing is such a scumbag con, and even if it taints your parents faith in humanity to explain, it's worth the time hardening their defenses. If it helps, there are several easy tutorials online about making strong passwords. You can Google them. Video-chat is the easiest, most gratifying thing you can teach a beginner of any age. If they own a laptop, tablet, or smartphone, and hopefully have wifi access and a built-in camera, the pieces are in place. It's just a matter of re-introducing them to make what is essentially a phone call. In the store, Creatives or Specialists often demonstrate by setting up a video-chat between two people who are two feet apart. What's nice is they can see what's happening on both sides, not only what it looks like to call someone, but what it looks like on the other person's screen when the call comes through. And then boom, you're speaking on camera. Skype, FaceTime, and GoogleChat are old news to most computer users, but such a blast every first time around. It opens a door to chatting with distant family, particularly with grandchildren, and it's a cute dose of "The Future is NOW!" I have to apologize for a late follow up to an excellent email I received. A reader was able to send me Apple's own chart showing the increasing gap in performance between older iPhones and new iPhones. The curve is exponential, as you would expect, following Moore's Law. (Moore theorized that processor speeds would double every year, and the rate of change has actually been even faster.) It follows that computing devices outgrow their previous iterations by larger and larger gaps. While a woefully misinformed New York Times Magazine article about Apple drew deserved mockery and predictable fan outrage, the real damage, this reader noted, was that it pulled attention away from the discussion. The article buried the chance for fair analysis about obsolescence by trying to sell the notion that obsolescence was sinister and planned. I also received a fair number of messages from people who couldn't believe the story about the customer thinking their song had gotten stuck in a USB cable. However, I also received four other examples of the same story from Apple Stores and resellers all over the world. In one case, the customer was sure the entire music library had gotten stuck! You can't make this stuff up. This article was republished with permission from McSweeney's and is the sixth in an ongoing column series.